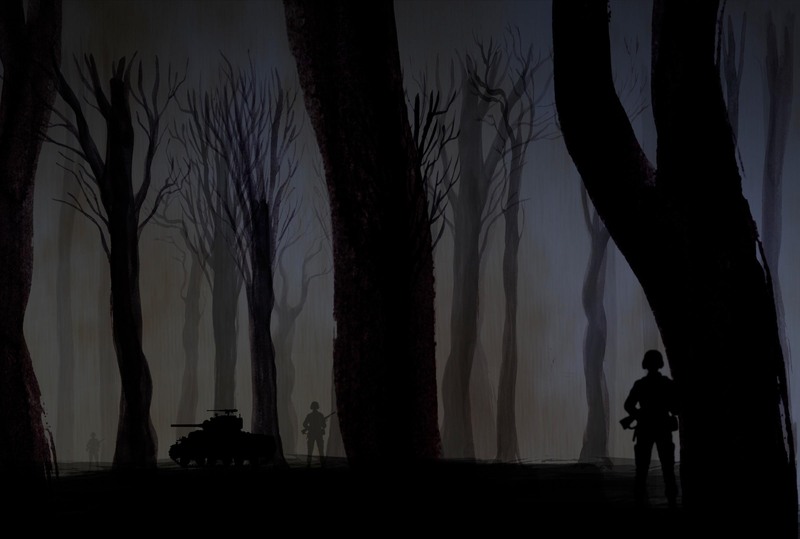 Before the men of the Ghost Army made armies appear from nowhere, some of them worked on making things disappear. Under the watch of the 603rd Camouflage Engineer Battalion, not yet assigned to the Ghost Army, an entire aircraft factory disappeared from the coast of Maryland – at least, from the air. When America entered the Second World War, there was a great deal of anxiety regarding German bomber strikes on the US mainland. 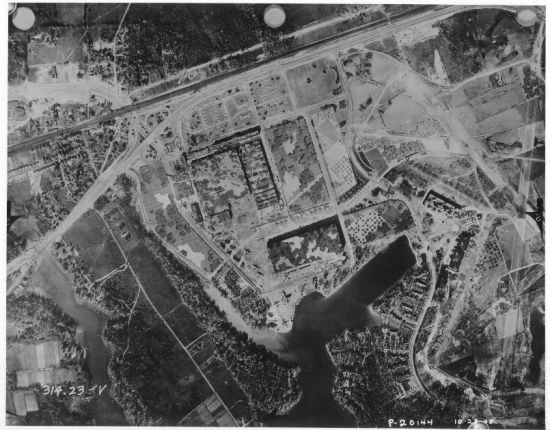 Though such bombing threats never actually materialized (Germany possessed neither the bombers nor the forward bases necessary to carry out such strikes), American war planners recognized the need to disguise important military installations from the air with camouflage. 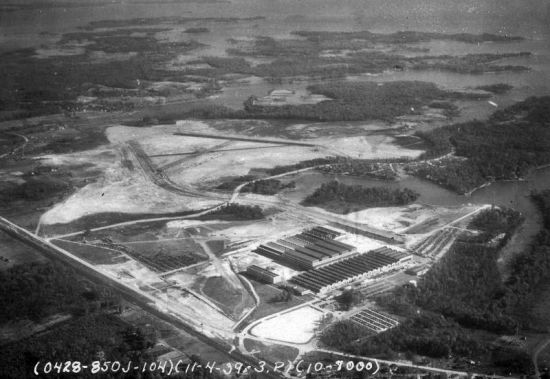 The Glenn L. Martin aircraft factory in Middle River, Maryland was one such location. The factory churned out bombers (the most famous being the B-26 Marauder) and attack aircraft for Allied forces. In 1942, the 603rd Camouflage Engineer Battalion helped make the factory disappear. 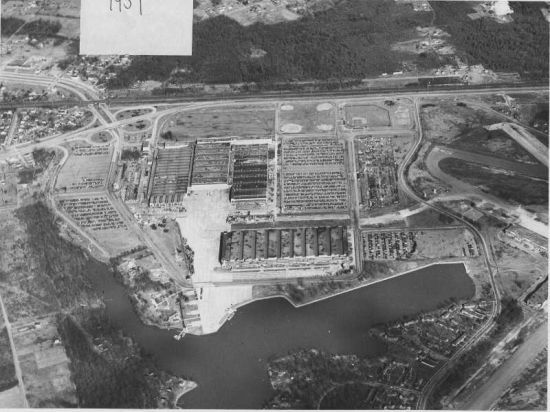 Veteran Ned Harris of the 603rd worked on the plant, noting "Our outfit was responsible for disguising that ...from the air, it looked like it was the countryside." Below are some images of their work. This first photograph is an aerial photograph of the Martin factory in November of 1939. The runways are not as developed and the buildings and adjacent parking lots are still small. Photo courtesy of the Glenn L. Martin Maryland Aviation Museum. The aircraft factory has been camouflaged in this photo, dated 1946 (but likely taken during the war, based on the aircraft types on the tarmac). The buildings have had camouflage paint applied, and the parking lots to the left and right of the main complex have been covered with camouflage nets suspended from posts. Even the tarmacs have been painted to look like fields in the countryside. Some shadows are evident, but there were antiaircraft batteries tasked with keeping German reconnaissance planes at too high of an altitude to notice the shadows. Photo courtesy of the Glenn L. Martin Maryland Aviation Museum. This photo was taken in 1951, after most of the camouflage had been removed from the buildings and tarmac. Some of the paint still remains, but this image gives a good approximation of what the factory would have looked like before the 603rd worked their magic. Photo courtesy of the Glenn L. Martin Maryland Aviation Museum. Once the disguise was complete, it was time for the 603rd to take their talents on the road. In January of 1944, the 603rd joined a handful of other specially picked units to form the 23rd Special Troops, otherwise known as the Ghost Army. Their mission fundamentally changed from hiding things on the American coastline to making things appear on the European front line.